Welcome to the Headquarters website for the Rose Li School of Chinese Internal Martial Arts. It's a moving meditation that reduces stress and anxiety, it's a martial arts system that allows you to hit with enormous force and you don't need to go to a gym to practice: it goes where you go. We specialise in custom, bespoke 1:1 consultations and small group sessions. Trained in Beijing in the 1920's & 1930's Li Shaochiang (know as Rose Li) was the finest Xing Yi boxer and teacher of Chinese Internal Martial Arts (Nei Jia) to come to the West. The School was initiated, and named by Miss Li, prior to her death in 2001, so that her teaching lineage could continue. Our school is based at Pineapple Studios in London's Covent Garden. The purpose ﻿﻿of the School is to provide the highest possible quality tuition in Chinese Internal Martial Arts (Nei Jia). We do this by having a heritage that originates at the teaching source of excellence for Nei Jia: the Temple of the Fire God in Beijing. We provide martial arts tuition for complete beginners to professional martial artists. We are now running 1:1 pain release mobility classes. Contact the School if you're interested. 1:1 Chinese calligraphy classes are now up and running. Please email the School if you're interested. Custom 1:1 tuition at our North London annex or via Skype - contact the school if this interests you. Small group tuition in an open access class environment at Pineapple Studios in London's Covent Garden. You can book an open access class at our HQ at Pineapple Studios via this website on the "Book a Class' page. You may pay via card or direct debit. Simply click on the calendar slot you wish to attend and follow the instructions to register for a class. You can also purchase group sets of classes or packages depending on your budget and time - these are called 'memberships' on the Book a Class page. Please note that the School discourages drop-ins, non-registrations and cash payments as this encourages late or non-payment. If you drop into a class at Pineapple, you will be asked to register for the class prior to taking the class. An administrative fee of £5 per Pineapple class will be added if this occurs beyond your initial session. If you're not based in the UK you can also book Skype classes as well. Remote sessions can include consultations on internal martial arts to full workouts. Please contact the School at roselischool@gmail.org if you're interested in any other classes or classes at any of our satellite schools. Our Headquarters at Pineapple Studios specialises in small group, open access, tuition. You can therefore experience the benefits of 1:1 martial arts instruction without the expense. This allows more personalised attention enabling you to achieve your goals faster. We teach our classes to all skill levels, so whether you're a novice or a pro, all of our classes will challenge you at your own level in an intimate class setting with like-minded people. All levels of practitioners are welcomed to our classes and you need no prior experience of Nei Jia or martial arts before you attend. The Headquarters runs weekly open access classes in Nei Jia and specialised workshops such as beginners Xing Yi. Go to the 'Book a Class' tab for timetable and booking information. Our North London annex concentrates on 1:1 and small group tuition in all aspects of Nei Jia including weapon systems (notably jian). Contact the School here if you're interested. Our Bristol annex specialises in Tai Chi and Ba Gua for beginners, See here. The System we teach is unique. You will not find it taught elsewhere. The aim of the System is to allow the individual to move with greater freedom, power and articulation. This is accomplished by focusing on the individual's movement experience via the application of key principles and a theoretical framework that underlies the System. This enables a creative and accessible exploration of the System's technical movement principles such as power generation, suppleness, economy/efficiency, must-directional alignment and trait removal. As students remove habitual patterns they then cultivate an increasing sensitivity to their own mind-breath-body experience. The result is a deeply embodied awareness both as martial artists and in daily life. The System uses a theoretical framework and a step-by-step pedagogic method that focus upon the individual learning experience and self-directed reflection. There is a constant dynamic conversation between 'How does this feel?' (i.e. embodiment), the underlying theory and the instructor. This means that tasks are specific and the student is not left to wallow or wander. It is for this reason class sizes are purposely kept small. The School is one of the few in the West teaching the whole Chinese Internal Martial Arts system in the same manner, and with the same syllabus, as that taught in the 'golden age' of Chinese martial arts in Qing Dynasty Beijing. Our learning system emphasises not merely what you do but also how you do it; this means that the complex nature of Chinese Internal Martial Arts is explained in a concise and clear way. The roadmap of the System is based on physiology, anatomy and mechanics (mechanics as in Physics!). What this means in practice is that the System allows learning to be composed of a series of building blocks that evolve into more sophisticated (Complex) but simple movement patterns. Miss Li's martial arts biography may be read in the late Robert Smith's book 'Martial Musings: A Portrayal of Martial Arts in the 20th Century'. Miss Li also provided Robert Smith with some of the photographs in Robert Smith and Donn Draeger's book Comprehensive Asian Fighting Arts. An obituary published on-line by the Tai Chi Union for Great Britain, some time after Miss Li's death, may be found here. Robert Smith also writes about Miss Li (calling her the greatest Xing Yi boxer ever to visit the United States) and her teacher ('One of the greatest boxers China has produced') in his book on Xing Yi here. Rose Li was one of the few people that were instrumental in introducing the full system of Chinese Internal Martial Arts into the West, particularly in the USA and UK. The School remains the sole organisation authorised by Miss Li for continuing her teaching and is run under the auspices of its Principal Instructor Maurice Passman. ​Our basic syllabus consists of Tai Chi, Ba Gua and Xing Yi all taught as a unified and integrated system. This basic syllabus concentrates on teaching the Principles and Characteristics that form the framework of the System. The aim of this initial learning is to create a foundation for the body to function well. The System uses movement, alignment, intention, breathing and body structure to gain awareness and condition the body. Our intermediate syllabus builds upon the principles learnt previously. The use of biomechanical principles are examined, how spiral motion optimises the application of force vectors and how a body's structural integration/disintegration is applied in practice. The breathing techniques taught within the basic syllabus, used to provide the bridge between the physical body and the mind, are extended and their sophistication increased. Lastly, more time is spent on building up the body's physical components martial elements such as core strength, force application and movement optimisation. The advanced syllabus consists of extending the basic syllabus to integrate physiological and neuro-psychological exercises into our martial arts practice. These advanced exercises, founded upon a Taoist/shamanistic unitary vision of Existence, form the real foundation of the System. The Nine-Form basis for these advanced practices were first documented nearly two thousand years ago in the Baopuze (﻿﻿抱朴子). Weapons, Chinese language (Mandarin) and Chinese calligraphy tuition form an integral part of the advanced syllabus. Our system has it's roots from Northern China with a direct lineage to some of the most renowned internal boxers. The School provides tuition in the three core arts of Nei Jia, Tai Chi, Ba Gua, and Xing Yi as well as Mizong Chuan/Yue Jia Ba Shou and weapon systems (mostly jian). Our martial art lineage is second to none, having it's origin directly from of Deng Yunfeng's school at the Temple of the Fire God in Beijing. Our martial arts family includes Geng Jishan, Sun Lutang and Huo Yuanjia. Deng's school, originally set up by Geng, became a learning centre of excellence for considerable numbers of famous martial artists including Sun Lutang, Li Cunyi, Yang Chenfu, Wu Jianchuan and Chen Tinghua. Many of the original exponents of the Chinese Internal Martial Arts systems taught today sought tuition and guidance from Geng. Geng, in his latter years, bequeathed the school to Deng Yunfeng. 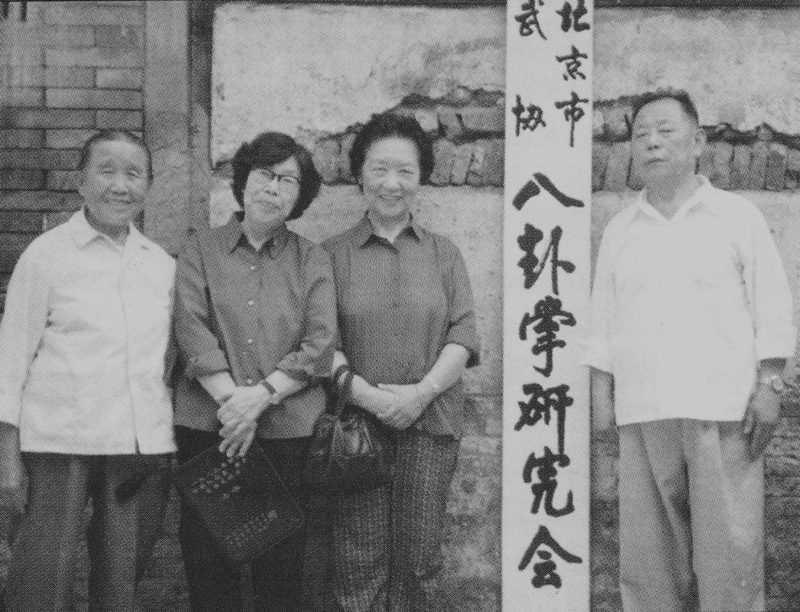 Geng Jishan was also one of the founding fathers of the Chin Woo Althetic Association (Geng's son, Geng Xiaguang, was sent by Geng to teach at the Association). Pictures of the Temple and Deng can be found in Hedda Morrison's book 'A Photographer in Old Peking'. 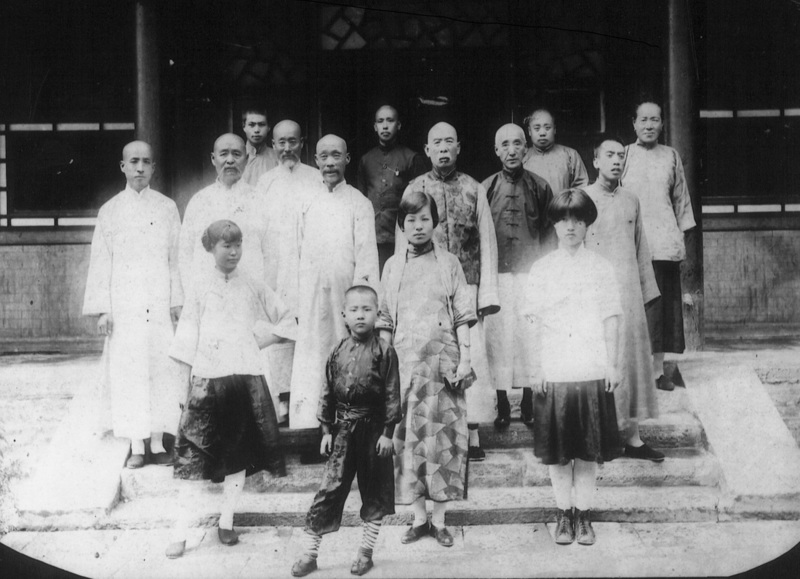 Below is a photograph celebrating Miss Li's formal adoption into Deng's martial arts family. Miss Li is in the front row on the right. Geng Jishan is the figure in the brocade jacket in the second row. The smiling man in white is Miss Li's teacher, Deng Yunfeng. Sightly behind Deng, is Liu Fengshan. Miss Li's father is in the dark jacket next to Geng, whilst her mother is in the back row on the right. Rose Li's father's family were minor Han Chinese royalty, whilst her mother was Manchurian - this was one of the reasons that her father could obtain and afford to pay for the best martial arts tuition available. Teaching martial arts to a female was extremely rare at the time. Rose Li's father was responsible for the Chinese coal industry under the late Qing Dynasty. 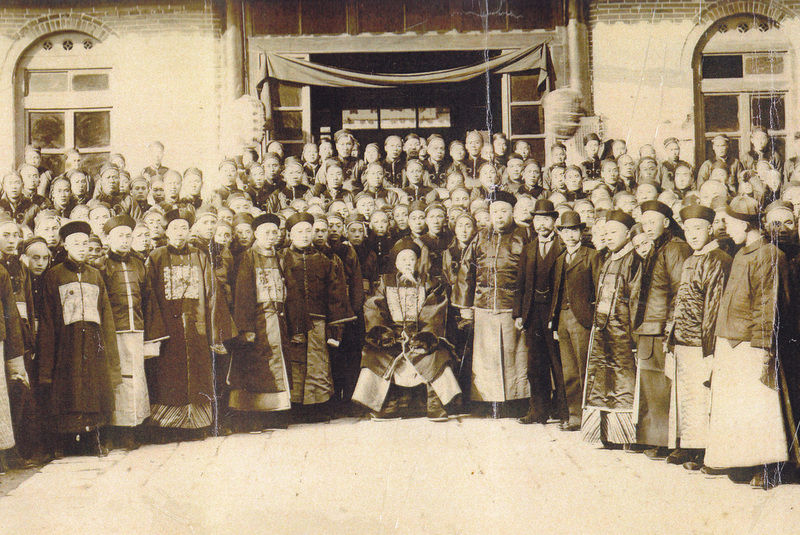 A photograph of Rose Li's father, together with other officials of the Qing administration, is shown below. He is the smaller figure in Western clothing on the right hand side. After Deng's death, Rose Li continued to have contact with and visit the remaining students from the Temple of the Fire God School. Rose Li travelled to Beijing on a number of occasions in the late 80's and early 90's and met with and taught Sun Lutang's daughter Sun Jianyun, Gao Zeying and other members of our martial arts family. See the picture below. Copies of some of the photographs from these visits were subsequently given to Robert Smith and published in his book Martial Musings.